Boston Twins: Pregnant Chicks Rock at Fishing! 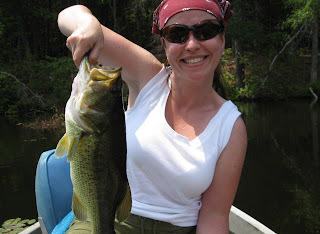 Pregnant Chicks Rock at Fishing! I caught my first largemouth bass ever yesterday, it was extremely satisfying and alot of fun! And I'm going to keep on fishing through this pregnancy until I weigh down the boat or canoe so much that our trolling motor just gives up. Our next big camping trip will be in a couple weeks when we'll be trekking back up to Dartmouth's Second College Grant (Wentworth Location, NH) to stay in the Pete Blodgett cabin which is in the Hellgate Gorge Area, where we hope to land some Brook Trout. Hopefully we'll get at least one nice one to eat - trout are on my list of allowed fish to eat a little at a time. This article from Science Daily says that Pregnant Women Should Eat Fish After All and discusses good and bad seafood (I am avoiding swordfish and shellfish) and this one from New Hampshire Environmental Services talks about eating small amounts of freshwater fish, including stocked and native trout. While we're up in the woods, we're trying to catch the food - all the while trying not to BECOME the food for the many mosquitos and black flies. They say that DEET is safe for pregnant women, but I try to stick with picaridin and lemon eucalyptus, which seem to help. 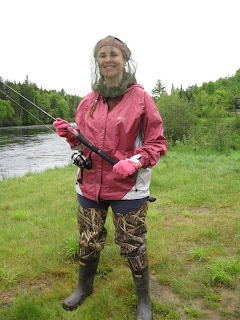 And when the mosquitos are REALLY bad, we have our head nets to keep them at bay! 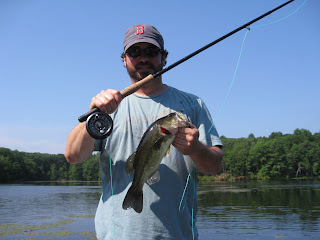 Finally, here's M who caught his first bass on the fly... he used a little black "streamer" fly on his fly rod. He was pretty proud of that - but mine was bigger!